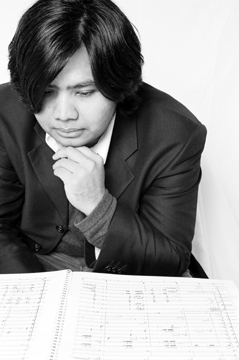 Tazul Tajuddin (PhD) is a Malaysian composer currently an Associate Professor in composition at the Faculty of Music, Universiti Teknologi MARA (UiTM) and was a Visiting Scholar at Harvard University. He held an academic post at the Faculty of Music as Deputy Dean of Academic and Head of Composition program where he led many exciting international and local collaborations. Since 2010, he is a project leader, artistic director and conductor of UiTM-klpac Composers Concert Series to promote students and young composers and performers to perform new works. He was former President of the Society of Malaysian Contemporary Composers (SMCC) and currently as Vice-President. He has received academic awards such as Fulbright Award, UiTM Academic Award and numerous composition awards includes the prestigious Toru Takemitsu Composition Award, Witold Lutoslawski Award, Japan Society of Contemporary Composers Award, New Millenium Award, UK among others. He has written more than 50 works ranging from solos to orchestral works and an opera, Opera Puteri Saadong which received major Malaysian Ministry of Culture’s Creative Industry Grant funding. His works have been performed and broadcast in more than 16 countries in Europe, Asia, North America and Australasia as well as critical acclaimed reviews nationally and internationally. As conductor, Dr Tajuddin started conducting in 1991 as assistant conductor of the National Choir, Malaysia and later in 1997 and 2003 he was invited as guest composer/conductor. He has conducted his own works with Carnegie Contemporary Ensemble (USA), National Choir of Malaysia, National Symphony Orchestra of Malaysia and from 2001 to 2009 Sculpted Sound Ensemble with artistic director Derek Shiel in London, UK. Since 2009, he has conducted the UiTM Symphony Orchestra, Choir and Contemporary Music Ensemble as well as performed with UiTM Guitar Quartet. As a researcher, he has received LESTARI, Fundamental Research Grants (FRGS) and Exploratory Research Grants (ERGS) research grants from Malaysian Higher Education on Malaysian traditional music such as Keroncong and Mak Yong. His music such as the Arabesque¸ Tenunan, Mediasi Ukiran, Gamelbati and Pantun cycles have been inspired by Malay-Asian cultures, Islamic geometrical patterns and designs, and western European art combined with diverse contemporary cultural ideals. His music is published by Babelscores.com and Alexander Street Press (online). He has lived in the USA, UK and Europe for almost 17 years and now residing in Malaysia.